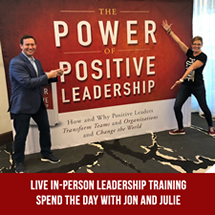 Spend the day with Jon Gordon and his Head of Training, Julie Nee as they share proven strategies and best practices to help you become a positive leader. You'll leave with a personal action plan to improve your team and organization and create positive results. *Certified Trainer opportunities also available. 1. Positive Leaders Provide Love and Accountability - I have found that the greatest leaders are able to lead with the right amount of both love and accountability. Alan Mulally, the former CEO of Ford and one of the greatest leaders in history told me, "You have to love your people. They have to know you care about them. But you also have to hold them accountable to the values, principles, culture and standards." Too much love and not enough accountability and your team will love you but they won't become great because of you. Too much accountability and not enough love and your team will initially strive to be great but will eventually disengage and fall short of their potential greatness. 2. Positive Leaders are Demanding without being Demeaning - Many think that positive leaders are people who smile all the time and don't care about winning. The truth is positive leaders want to win. They are very competitive. They challenge people to pursue excellence. They are demanding. They just aren't demeaning. Instead of calling people out, they call out the greatness within them. 3. Positive Leaders Unite the Team - Great teams and organizations don't happen by accident. Positive leaders invest a lot of time, energy and effort to foster connections among team members and create an environment where individuals unite and work together to create something amazing. 4. Positive Leaders Connect with the Individual - To create a united team, positive leaders make the time to communicate and connect one-on-one to build great relationships that build a great team. As Doc Rivers told me, "The most important thing I do as a leader is communicate with each person on my team. I have to know where each person is in order to lead them where I need them to be." 5. Positive Leaders Create Clarity and Generate Focus - People often think that focus leads to focus but it's actually clarity that leads to focus. The more clarity an organization, team and individuals have the more focused they will be. Positive leaders remove clutter, eliminate confusion, simplify, and create clarity that lets everyone know what they are supposed to do so they can take focused action. Everyone knows their job so they can do their job. 6. Positive Leaders Lead with Optimism - When Donna Orender took over as the commission of the WNBA she inherited an organization that lacked belief and optimism. She believed in what the WNBA could be and transferred her belief and optimism to her team and turned around the organization as a result. Leadership is a transfer of belief and in a world filled with pessimism and negativity your optimism and belief is a competitive advantage. 7. Positive Leaders Inspire with Vision and Purpose - Through adversity, obstacles and challenges positive leaders consistently rally their team with a shared vision and a greater purpose. They point everyone towards the vision of where they are going while reminding everyone why they are going there. To read more stories and specific examples of positive leadership and to implement the framework visit PowerofPositiveLeadership.com. 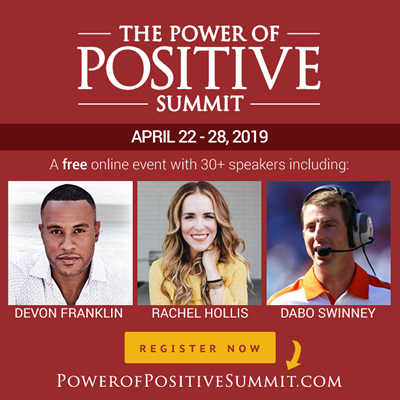 and Coach Dabo Swinney, with us for The Power of Positive Summit! Everyone will experience adversity and change. How you respond is what matters most. 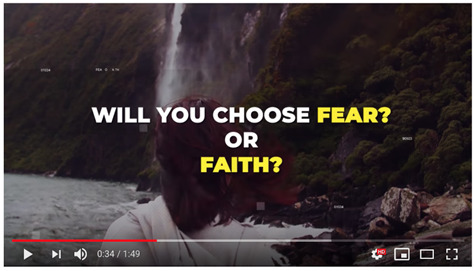 I hope this short video will encourage you to embrace change and create a positive future.